I finished up my block for Cara from Me? A Mom? for our Sew Beautiful Bee. She asked for "home" blocks. She is making them into a quilt to donate to a family with a baby girl in NICU. This was a fun block to make. I also made some progress on the back for my hexagon quilt. 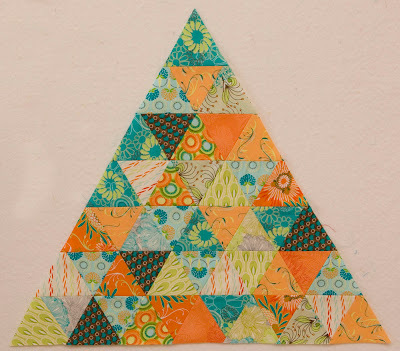 I'm using all those triangle scraps that result when cutting hexagons. This block is about 17" tall. I have five more to go. Finally, this is what I find when things get too quiet around here. I usually put a lock on the dog kennel so they can't get in, but I forgot this morning. Why is this their favorite place to play? Because it usually has a lock on it? The house is really cute, and I love the triangles. Great colors! love the house block, so sweet. They are a very busy bunch! Now I want to know which of them was the leader and what they said to the other(s) to get everything in there. That had to be a funny thing to watch - you should set up little spy cameras to catch the action! Love your house block! The sun is awesome. And the flower! Those pictures crack me up. I always know I'm in trouble when things get quiet! Oh I so need a cage!!! A big one, with a cover/sound muffler!! I love all of the little details on the house block - the shades and the flowers - beautiful. There is something about small boxes that kids just love. If dog hair/germs are a kennel problem, get them a big box to play in. :) They are way too cute. Oh my gosh, your kids are too funny! Mine would absolutely do that if we still had a kennel for the dog :) I adore your block for Cara, it looks fantastic!! I love the tree you made! LOL, I'd be glad that's their favorite place to stay! Love that triangle block. I love it when you can make something from the waste of another quilt! Adorable picture of the kids! A kennel is just like a cardboard box to kids but better because they can see out. At least this time while they were being too quiet they weren't making a big mess. I love my block, thank you!! As for the cage, don't question it, go quilt! LOL Can I come over and borrow it for my kids? 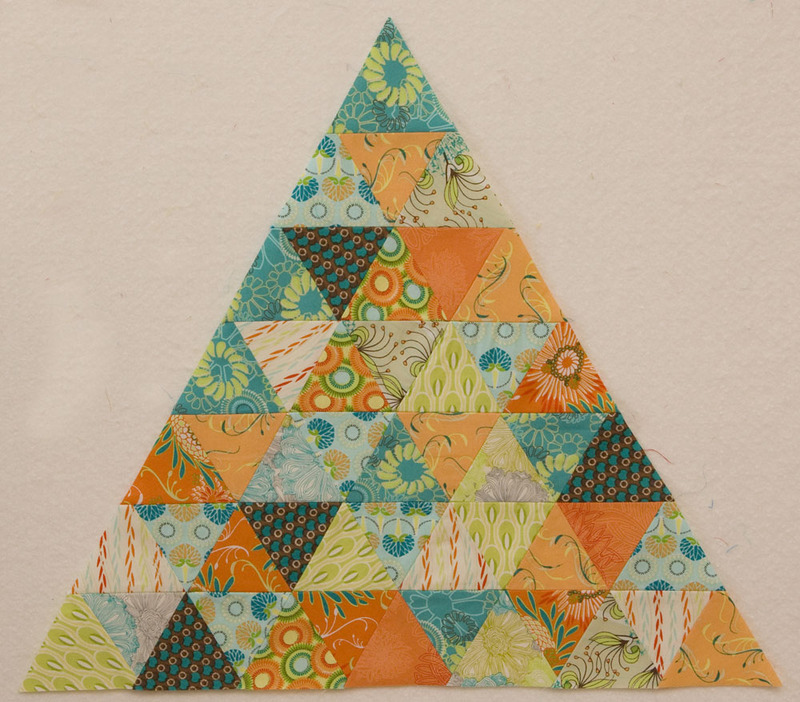 Those triangles looks daunting....but lovely! When my daughter was little she loved to play in cubby holes. And, she really wanted one of those plastic doggie igloos to use for a playhouse. 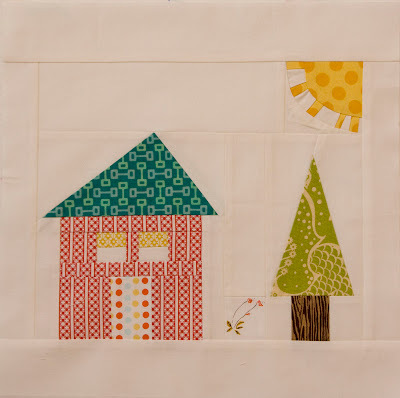 Love the home theme block with the sun, and even flowers! They always go for the dog cage! That photo of the kids in the dog crate is one of the funniest ever! Hilarious! I know that feeling when it's just too quiet. PS love the house block. I'm laughing. Love the kennel shots. They're happy and creative, what more can you ask for. Ha ha! I say leave them in there! Only kidding! i love your house block. i second all of those that suggest leaving the kids to play in the crate. i'd love to contain some of the toddler mess here.